We are proud to announce that the add-on has been successfully ported to CS-Cart 4.5.1. Update isn't required from the previous version. 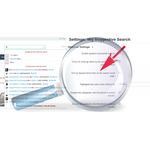 New release of Suggestive Search CS-Cart add-on loaded with new features! 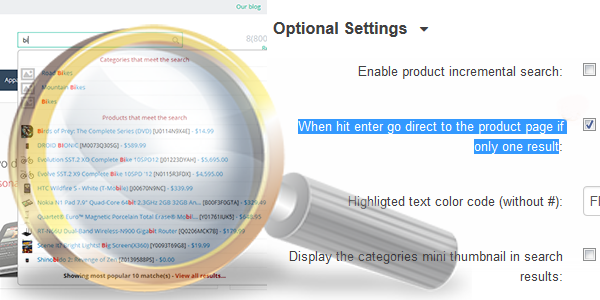 We have received many-many requests from CS-Cart store owners to add the ability to go direct to the product details page when hit enter and there is only one result. In this version we have implemented this feature. You have the ability to enable/disable this function in the admin panel. Also we have received request to short the search result by date, newest first, we have implemented also this feature. Also there are some other code optimizations to improve the speed, stability and security. Update is highly recommended. You can download the latest version from your account. Un-install the previous version and install the latest one. Meet a new release of Suggestive Search add-on for CS-Cart v4 editions with some new features and improvements. I just re-installed this the day before yesterday. What is the version # of this update? We are glad to announce that the compatibility with CS-Cart v.4.5.2 was tested, update isn't required from the previous version. You can search for the exact phrase or all/any entered word. If you have issues please contact us thru our site and describe as detailed as possible your issue. Don't forget to send us your cs-cart version, the add-on version, add-on settings, the way to reproduce the issue, etc. we use a field sku for our products can this addon work with that field as well ? Search in product code/sku is supported. For more info, live demo please visit the add-on details page. I like the new features you added, but I am still waiting for the ability to search on content pages also. Each suggestion is important for us. Forwarded it to our development section. Dear Sir I have a problem with your add on. When i search something and I have one or more products as a result when I hit the Enter on the keyboard I don't get a result and the most times it confuses my customers. The cs-cart built-in search engine does not support search by product code. Checking your site with your example search term (1605) realized that you have an older version, where this feature wasn't implemented. If you want to search by product code and pass it to the built-in search engine (when you hit enter) you need the latest version of add-on. Thom does your addon for which I had previously a licence which I used for a V3.0.6 store , does it also allow searches in a installed weblog or just the store ? The v3 editions are for cs-cart v.3.x.x versions with less features and you can search in products. For more details regarding the v3 editions, please visit the add-on details page.